We've now been publishing SCUBA News for 15 years - thank you all for subscribing. It has always been, and will continue to be, free. But this means that we can't pay any of our writers or photographers. However, if you want to reward the contributors you can now do so at Patreon. We'll share the contents of the tip jar between this month's writers, photographers and the Marine Conservation Society charity. If you would like to contribute an article to SCUBA News - e-mail news@scubatravel.co.uk. In our marine life section we've updated our notes on the Green Turtle. Has anyone dived in Gibraltar? E-mail news@scubatravel.co.uk with your experiences. Which Diving Agency to Choose? Which would you recommend? E-mail news@scubatravel.co.uk or post on our Qualifications page. I'm OWSI PADI Instructor and certify my students by providing PADI certification, I sometimes meet some requests from my students wishing to obtain the CMAS equivalent to the PADI course and I'm currently looking how to make it possible. In short, I want them to get the equivalence of their PADI certification in CMAS, how much will it cost me and how to get them? You can't get an equivalent CMAS card for a PADI qualification. Your students would have to do an extra course with CMAS. Which level they could go in at is defined in the CMAS - PADI agreement. Other agencies though, like BSAC, do issue CMAS cards. I am often told how adventurous, crazy or "brave" I am, and that I take big risks. I don't take crazy risks, but I do take calculated ones, and participate in activities that may seem overly risky, but I make sure all precautions are taken. More people are killed in car accidents than in "adventure sports" accidents. I love nature, I love diving, but I am not reckless, far from it. My husband, Randy, and I took our young adult children, Wes and Ally, on our family dream trip to Guadalupe Island to cage dive with Great White Sharks, and we could not wait to get on the boat and into the water. Before you begin to think I am the world's most irresponsible mom, you should know that Great White Sharks do not "prey" on humans. Seriously! Of the 33 or so Great White bites a year, most of them are "sample" bites, most are not fatal. We are the ones killing them in unsustainable numbers. Many divers are animal enthusiasts, and conservationists, and the idea of being in close proximity to these amazing and beautiful apex predators is downright exhilarating. On the last dive of our 6 day trip, I was in one of the cages with two other divers. I was taking photos when I noticed that the bait happened to be quite close to the cage. I prepared to take an awesome close up! The shark went for the bait and ended up slamming into the opening of the cage I was in. These cages have an 18 inch opening for photographers and it was just large enough for the 14 foot Great White to come in for an unintended visit…all the way to his pectoral fins. He got stuck, and it felt like an 18 wheeler had slammed into the cage. 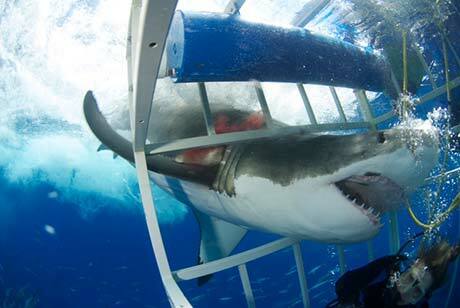 Great white shark enters the divers' cage. When the shark hit, the young man who was in the middle pulled me back…and believe me, I was grateful! The shark was panicked and thrashing violently…it felt like being in a big washing machine. I kept trying to hold on to the bottom of the cage, but just could not keep my grip, so I floated up toward the shark. The shark actually did a 360 degree turn in the opening, which caused his gills to bleed. My husband and daughter, watching from above, thought it was my blood, so you can imagine how upset they were, but my daughter who was taking photos kept shooting and caught the entire event from above. Such a professional! After what seemed like an eon the shark managed to free himself and took off, scared to death. While the shark was upside down I received a bump on the head from his snout, and he somehow ended up with my air hose in his mouth, so my air was wet and salty. What an experience! I wouldn't want to go through it again, but my grandchildren will think I am totally cool, when I have them. Talk about being up close and personal with a Great White! Shark hitting the author on the head. You know, I guess I could tell a harrowing tale of a Great White Shark "attack", but it just would not be true. No shark showed any aggression whatsoever while we were there. Hey, getting in a cage with Great White Sharks swimming around has inherent risk, but no shark at Guadalupe has attacked a human being, and I know people who have been with them outside of the cages, free diving. Would I go cage diving again? Yes, it was a breathtaking experience. I wasn't hurt, no harm done (except to the poor shark's gills) and I take full responsibility for being in the cage. I do plan to go again, absolutely. Lightning doesn't strike twice, right? Editorial note. Shark cage diving is a controversial subject. Some people are hostile to the idea, feeling that it affects the sharks' long term behaviour. But scientific research shows that if run properly, cage diving doesn't affect the behaviour of the sharks. And when compared to the damage done by shark culls and legal and illegal fishing, shark cage diving seems positively beneficial by bringing in income and giving local people a reason to welcome the presence of sharks. 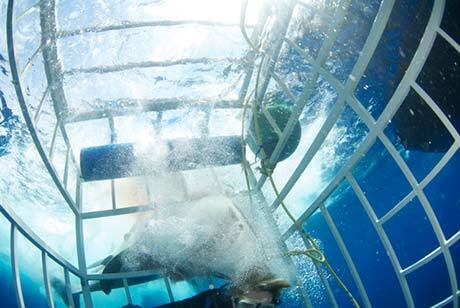 What do you think - would you go cage diving with white sharks? Let us know. Europe is woefully behind in its ambition of achieving a 'good environmental status' of her seas by 2020, according to a report published by the European Environment Agency. Only 4% of the marine species and habitats assessed have achieved the 2020 target of 'good' status. New study finds that the rate of global warming during this century has been as fast as or faster than that seen during the latter half of the last. The study refutes the notion that there has been a hiatus in the rate of global warming in recent years. The Marine Conservation Society wants you to report which washes, scrubs, creams, moisturisers, lotions, gels and pastes contain plastics. These end up in the sea where they gather toxins on their surface before being ingested by zooplankton and other animals, which in turn are eaten by creatures further up the food chain - and ultimately, us. Find out what to look for here. Released this month, new book spans many disciplines and focuses on a number of technical areas for divers. Two marine species make the New Species Top Ten, one of them a nudibranch that is the "missing link between sea slugs that feed on hydroids and those specializing on corals." A tourist's drowning in 2011 on a scuba trip in Key Largo has led to a charge of involuntary manslaughter for the British couple who own the charter boat. Earlier this year an NGO warned we could end up with 'as much plastic in our oceans as fish'. Here is what the experts said in an online debate on plastic pollution. Now you see it. Now you don't. The slender filefish has a way to stay off the seafood menu - it has evolved the ability to become almost invisible. The fish can camouflage its body patterns and shape to match its marine surroundings in seconds. Six research organisations have joined forces to save lives at sea by providing a marine monitoring and forecasting service. Federal fisheries officials in the Mid-Atlantic voted to create the largest protected area in US Atlantic waters, a roughly 38,000 square-mile region where scientists have found an abundance of deep-sea corals. Many people, even smokers, are not aware that the cigarette filter is comprised of thousands of little particles of plastic. In The Bahamas, the government tracks only large-scale commercial catch. Researchers though have found that they are missing half the catch which are caught during recreational fishing. With demand for seafood increasing and numerous fish species declining due to overfishing and other threats, scientists are proposing a seemingly drastic solution: close the high seas to fishing and turn it into "a fish bank for the world." Don't worry, they say, doing so won't affect the fishing industry's economic returns, and will ensure that profits from fisheries are more equitably distributed.